Cauliflower is one of our favorite ingredients because it takes on the flavor of the other ingredients so easily. While this recipe adds great variety to your meal, it is also an awesome appetizer for the family or friends. The sauce hides the flavor of the cauliflower so well, that even those of you who don’t care for vegetables can enjoy them! 1 cup of cauliflower equals one serving of vegetables, and 1 Tbs. of dressing equals one serving of fat. Preheat oven to 450°F. Grease a baking sheet (can line with parchment or aluminum foil) with coconut or macadamia nut oil. Set aside. Mix the garlic powder, salt, pepper, melted butter and hot sauce into a small bowl. Add the cauliflower into a large gallon-sized Ziploc bag. 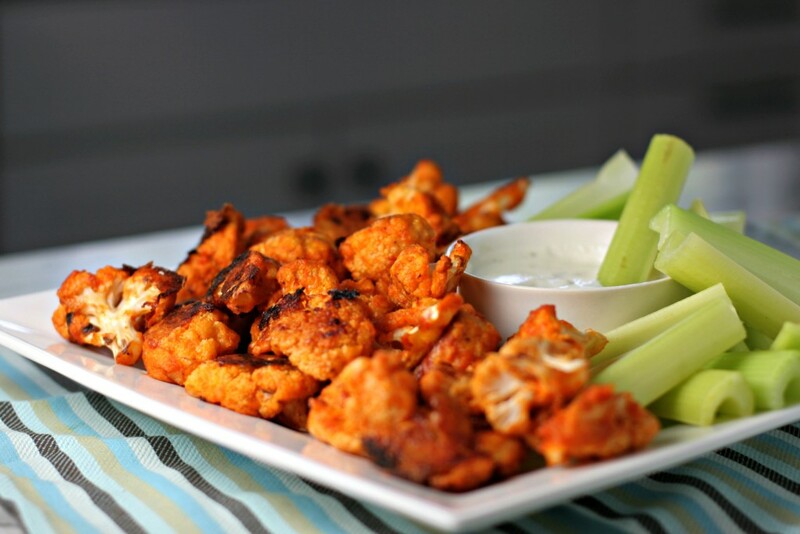 Pour the buffalo sauce into the bag and shake until the cauliflower florets are fully coated. Spread onto the baking sheet. Whish all ingredients together to combine. Season with salt and pepper. (**Make your dressing as thin or thick as you like by decreasing or increasing the coconut milk.) Store in an airtight container in the refrigerator for up to a week.